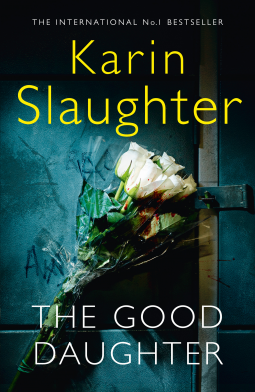 A superbly written police procedural with a very human protagonist and contemporary narrative. Ann Cleeves is the author behind ITV’s Vera and BBC One’s Shetland. She has written over twenty-five novels, and is the creator of detectives Vera Stanhope and Jimmy Perez – characters loved both on screen and in print. Her books have now sold millions of copies worldwide. Is it because I have watched an episode or two of Vera (the Detective series based on the novels in this series) or merely the fantastic way that Cleeves writes location, character and intrigue that I am enamoured with this novel? I don’t know – maybe it is a combination of the two and that I can clearly picture and hear Brenda Blethyn as I turn the pages. I read this in one sitting. 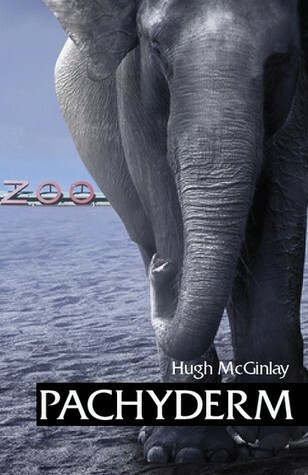 Start reading this novel and enter a captivating world where sins of the past juxtapose and intersect a current investigation. Cold cases are reviewed and personal memories are awakened in this thrilling narrative where corruption is served as the main course, redemption is a too sweet dessert. A remarkable story of strength, resilience, family and survival. In 1933, a ten-year-old Jewish girl, Fela Perelman, befriended a new family that had moved into her street in Lodz, Poland. There were three children in the Rozenblum family — Rose, Felix, and Maria. Fela and Rose became best friends, while Felix kept his distance. Five years later, Fela and Felix discovered that they liked each other, and soon became sweethearts. When war broke out not long after, the Jews of Lodz found themselves under German occupation, and were soon forced into a ghetto. For Fela and her family, and her community, it was the start of a descent into hell. Fela eventually survived the ghetto, forced labour in Germany, and then the last 17 months of Auschwitz’s existence and the death march out of it. For Felix, the Germans’ intentions were crystal clear. Late in November 1939, as a 17-year-old, he decided to flee eastward, to Soviet-controlled Polish territory. He begged his family to come with him, but they felt unable to. Felix spent the war doing forced labour in the Soviet Union, often in very harsh conditions. After the war, miraculously, Fela and Felix found each other. None of Fela’s family had survived. Of Felix’s immediate family, only his two sisters had survived — and they were now in Sweden. The young couple were bereft and alone. This is their story. A poignant memoir that is told in two parts: Fela’s story of life pre-world war two, a time of innocence and meeting the boy who was destined to become her husband and an economically worded description of life during the war and as an inmate of Auschwitz and other detention centres. I am glad for the sparseness of words – what Fela has written must have been very difficult to survive let alone recount afterwards. The horrors penetrate event the toughest psyche. Fela story ends with her migration to Australia. Felix’s story is a little different – yet just as haunting and survival just as miraculous as that described in Fela’s narrative; forced labour in Russia was no doubt an extremely difficult and perilous, yet Felix survived and post war reconnected with Fela and eventually migrated to Australia. What a remarkable story. What resilience! I think we all would benefit from reading these courageous personal stories – a reminder of just how hostile life was during this ghastly inhuman war (all wars are unconscionable). There are lessons for all here. Love the cover art – the images and the tactile paper. A mesmerising, harrowing and ultimately uplifting novel from the 2015 Miles Franklin winner. Abandoned by her mother as a toddler and only occasionally visited by her volatile father who keeps dangerous secrets, Justine is raised solely by her Pop, an old man tormented by visions of the Burma Railway. Justine finds sanctuary in Pop’s chooks and The Choke, where the banks of the Murray River are so narrow they can almost touch—a place of staggering natural beauty that is both a source of peace and danger. Although Justine doesn’t know it, her father is a menacing criminal and the world she is exposed to is one of great peril to her. She has to make sense of it on her own—and when she eventually does, she knows what she has to do. A brilliant, haunting novel about a child navigating an often dark and uncaring world of male power, guns and violence, in which grown-ups can’t be trusted and comfort can only be found in nature, The Choke is a compassionate and claustrophobic vision of a child in danger and a society in deep trouble. It once again showcases the Miles Franklin Award-winning author as a writer of rare empathy, originality and blazing talent. Justine lived with her Pop as her father, Ray, was rarely around. Her mother had left when she was three years old having never recovered, both physically and mentally, from Justine’s birth. Pop’s shack near the banks of the Murray River where he and Justine spent their days was barely liveable – Pop had survived the war, but his memories of the Burma Railway and his part in the building of it, were forever in his mind. 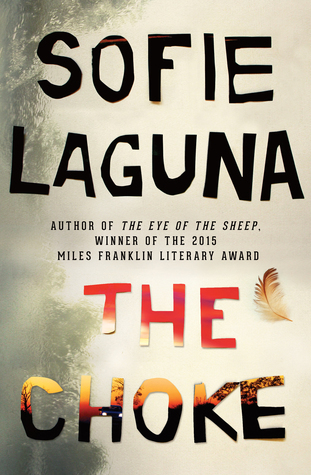 The Choke by Aussie author Sofie Laguna is an emotional, dark and unsettling novel which will break your heart and give you hope all at the same time. Justine is a naïve young girl, with no-one around her but men, both old and young – no-one to explain about life to her. She can’t verbalise the questions; therefore, she doesn’t have the answers. “I never had words to ask anybody the questions, so I never had the answers.” P233. I’m finding it difficult to review The Choke as I feel I’m unable to do the author justice. Her writing is unique; her descriptions, both of the area Justine lives, and Justine’s life and her internal traumas is outstanding. I could see the danger coming for Justine, but it was like watching a train wreck and not being able to do anything about it. I loved The Eye of the Sheep and Sofie Laguna has another 5 star winner with The Choke in my opinion. Very highly recommended. What an outstanding read! 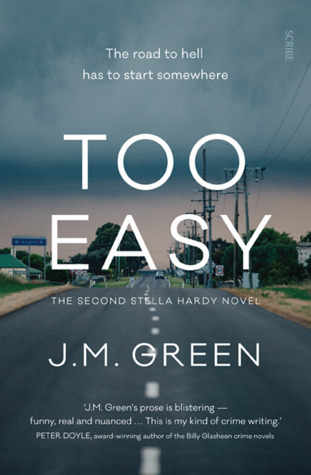 This is my favourite Australian work of crime fiction this year – the dark humour, the flawed, complex, relatable characters are a joy to read, the Australian landscapes – political, physical and social are so relevant and the narrative is compulsive reading – EXCELLENT!!! Stella is the social conscience of contemporary Australians. This is astute and wickedly funny writing, deliciously enthralling. Five stars does not do this book justice!